One thing we didn’t have in our old house that we do have here in the new one is an actual entryway. 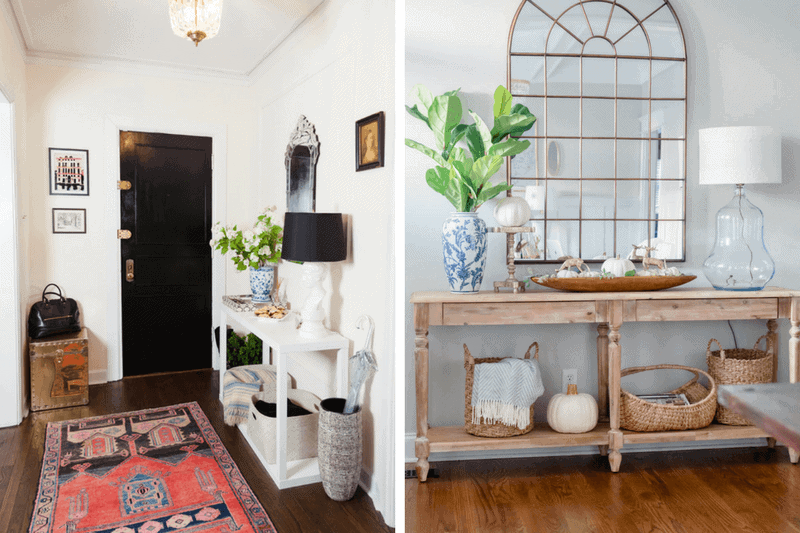 In our old house, when you opened the front door you were looking straight at the staircase and the living room – there wasn’t much space to create a true, welcoming entryway, and I always wished that I could have had something a little more formal. 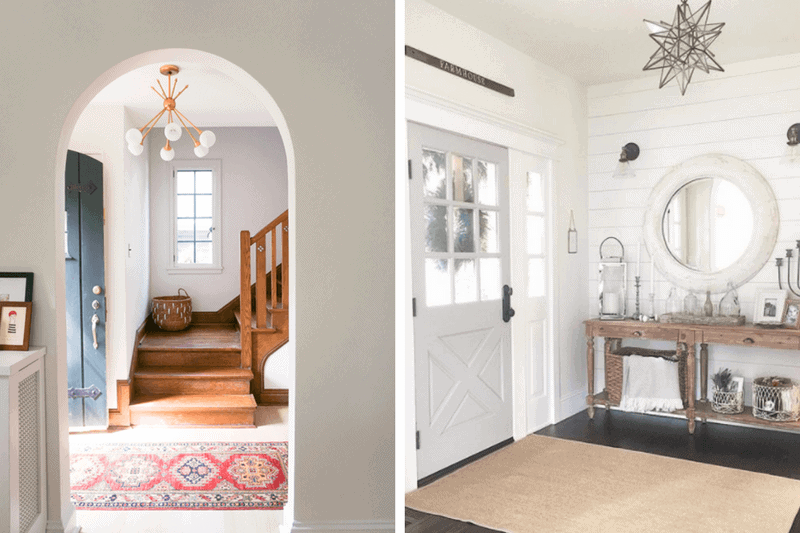 This house doesn’t necessarily have a formal entryway, but there’s a small hallway that the front door opens into and it’s got tons of potential for being the pretty little entryway that I always dreamed of. In addition to actually finally having space, I’m realizing how much we need to create an actual spot in our home for all of our stuff to land when we get home every day. As of right now, most of our stuff ends up piled on the dryer in the (tiny) laundry room, and that isn’t working out well for anyone. Corey’s been laughing at me as we’ve begun settling into this house because I keep declaring that everything is “a priority” to get done. Our bedroom is a priority. Jackson’s bedroom is a priority. The dryer broke, so that’s a priority. The dishwasher turns itself on – that’s a priority. The dining nook is a priority. But this entry situation? It’s a priority. I’ve been working a DIY entry table to put here (more on that soon), so step one is almost complete and I’m feeling like we might be able to get this thing under control. 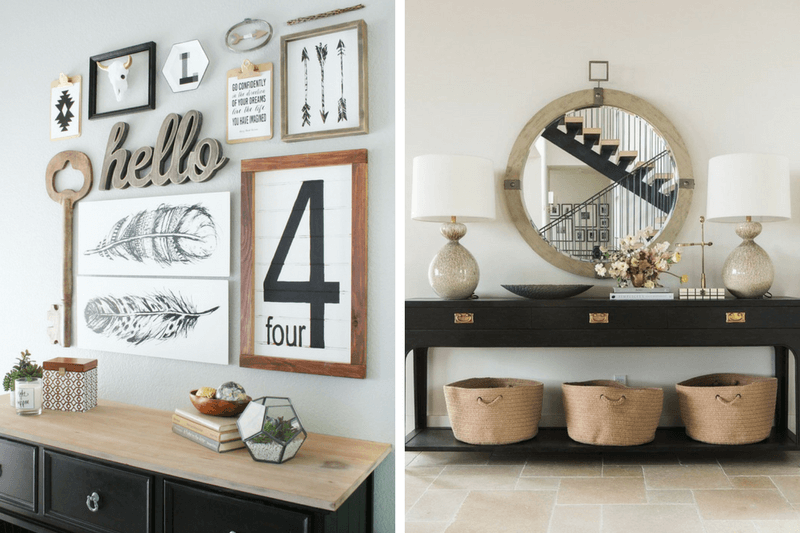 I’ve been spending a lot of time gathering inspiration for what we want to do with the rest of the entry, so I thought I’d share a roundup of some of my favorite entryway decor ideas, along with a few of the things we’re thinking about doing for our entry. Get ready to be inspired! And, if you’re looking for inspiration on a different topic, be sure to scroll down to the bottom of this post for links to other inspirational roundups I’ve written! This is our first step for our little entryway overhaul. We don’t have a ton of space (actually, the photo from The EveryGirl above is a good comparison to the size we’re working with), so we’re keeping the console simple and skinny – so no one feels like they’re walking through a maze the second they come in the door. When you’re working with a small entry, a good way to make the space feel as big as possible is to choose an entry table that is open and airy – notice how neither of the consoles above have drawers or bulky lines? Keeping things simple, open, and streamlined makes the entire space feel a little bigger (and, with some baskets, you can still have plenty of storage space!). When you’ve got a tiny space, this is the easiest way to make a big impact without a ton of work. Your entry is the first thing people see when they come to your home, so a bold light fixture is a really fun way to make a statement. We have vaulted ceilings throughout most of our home – but they’re not in the entry, so we won’t be able to go too crazy with the lighting. I haven’t begun to look at lighting options yet, but I’m sure I’ll round up a few of our choices once it’s time to choose something – the one from Wit & Delight is calling to me, though! I’ve always wanted to give wallpaper a shot – I’m kind of thinking our entryway might be a great way to do it. You can cover your entire entry (ours is like a small hallway, so it would be easy to do the whole thing), or just one wall – it just depends on how bold you want to go! This isn’t even something I’ve begun to think about, but I can definitely see myself adding some wallpaper or a fun stenciled pattern to one of our entry walls down the line – why not?! 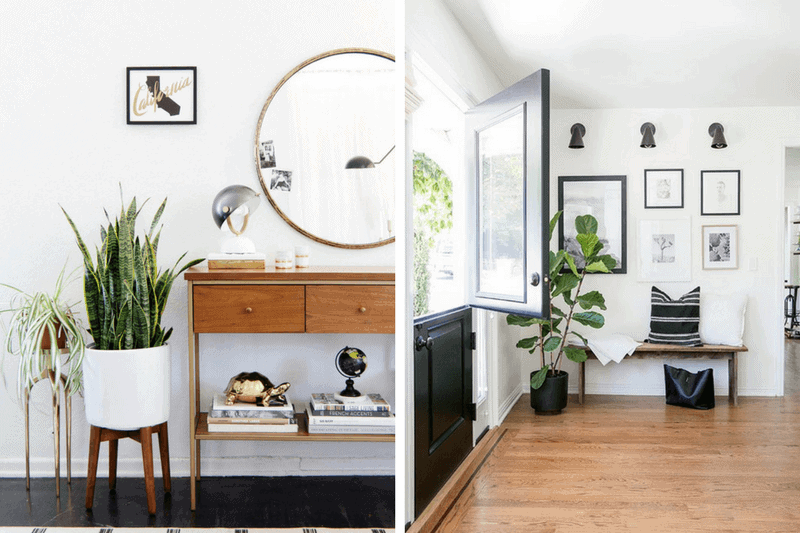 There are generally three approaches to adding art to your entry (or, really, any space). You could add multiple pieces of art in a gallery wall, you could add one big piece of impactful art, or you can just add a mirror. I’m leaning towards a miniature gallery wall that will include a big mirror – but we’ll see how things go once we actually get everything all set up! 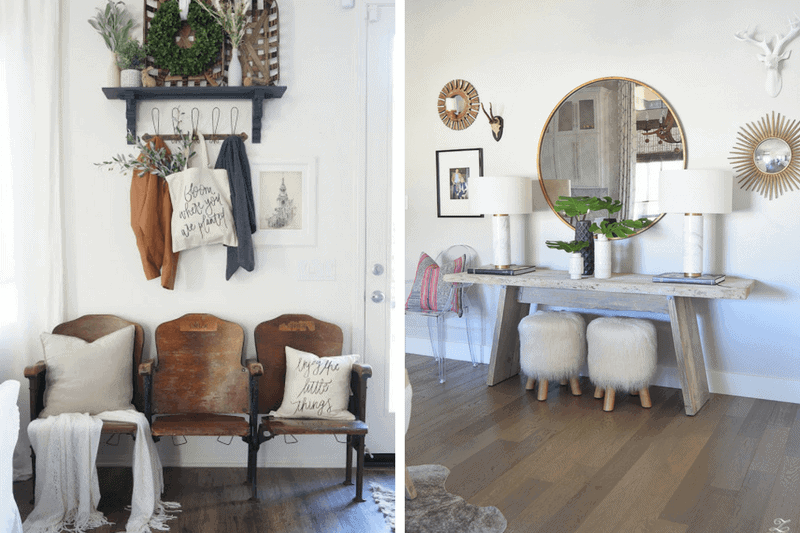 I love a good bench in an entryway, but that’s not going to be the approach we take in this house – we need a table to act as a landing spot for my purse, our keys, and everything else we’re typically lugging when we come inside. I really love the idea of a pretty chair or a miniature bench for a spot to sit and put on or take off your shoes, but I don’t know if we’ll squeeze it in. One of my favorite ways to add seating to an entry is by tucking a couple of small stools under the entry table – it’s such a functional way to add a little bit of extra seating to your home, and they stay out of the way when they’re not in use. Genius! If you ask me, no space is complete without a plant or two. I won’t lie – several of the plants I had been doing so well with at our old house promptly died when we moved here because I didn’t really have a good spot for them to land (everything is just different in a new house!). I’m wanting to add a few larger plants to our house, as well as a faux plant or two – I imagine we’ll end up with something fake in our entryway, because it gets exactly zero natural lighting. Whew. Are you feeling inspired? Because I am. 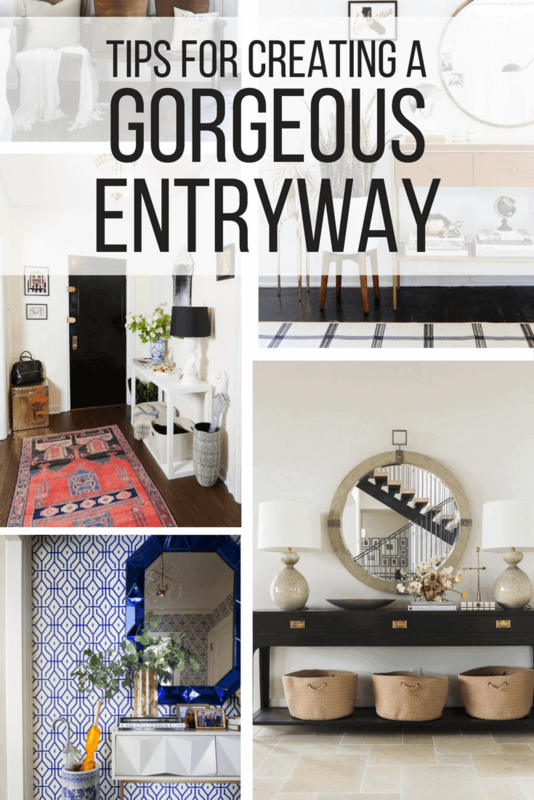 I’m so pumped to share our entry table with you once I get it all styled and looking pretty – and after writing this post and browsing all of these entryway decor ideas, I think I’m going to seriously start looking around for some wallpaper options!